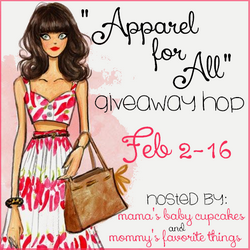 Welcome to the "Apparel for All" Giveaway Hop hosted by Heather from Mommy's Favorite Things and Michelle from Mama's Baby Cupcakes. This hop has a Clothing/Accessories Theme, and each blog has a minimum prize package of $25 per winner. After visiting my giveaway, make sure you use the linky below to take a look at the other blogs to see what they have to offer for you! Be sure to check out the Grand Prize on Mama's Baby Cupcakes blog for a chance to win from Mama's Jewelry, a site developed by Central Diamond Center to bring customized, gemstone jewelry often referred to as Mother's Jewelry, Family Jewelry or Birthstone Jewelry. and Lee is giving away an item of choice!! Lee Jeans is a favorite here!! They have some wonderful denim and other clothing items and we have been pleased with every item we've received so far! We are still using every single item received and they are some of our favorites! Both stores have items for adults and kids! So this will a fun giveaway to win! Mama's Baby Cupcakes, Mommy's Favorite Things and the "Apparel for All" participating bloggers are not responsible for sponsors who do not fulfill prize obligations. I'd love to win the Lee Jeans! I would really like to win an item from Lee. I would love to win an item from Lee jeans. The Lee Jeans. My daughter needs them badly. I am most looking forward to Zoey's Attic. If I were lucky enough to win, I would be very excited to win the Lee Jeans! I am most excited about the Lee jeans. I would love to win the Lee item of choice! I'm excited about the lee item of choice! I would love to win the Lee jeans! I only have one pair of jeans to my name. Most excited to win the Lee jeans. thanks! I would love to have the Lee jacket. That is a hard decision because I can use both prizes. For myself, I could really use a nice pair of new jeans. I'm most excited about winning an item from Lee Jeans! I'm looking forward to the Lee item. Hard one but I think I'm more excited about the item from Lee Jeans because I need some new jeans! I am excited about the Lee jeans! I reallt need a new pair! The Lee Jeans is a favorite here! I am looking forward to winning the Lee Jeans. I would like to look my best and when I wear Lee Jeans I do. I'm really looking forward to the one any item from the Lee jeans website!! Yahh so cool!! I need new jeans, I'd love to win the Lee jeans. Hmmm, I love the Zoey's Attic to get something for our daughter but I need new jeans so it is a complete toss up. The Lee prize sounds great to me! I would like the jeans. Thank you! Im excited about Zoeys attic. Id like to get a personalized book bag for my middle granddaughter. I would love to have a new pair of Lee's Jeans! I'm most excited about getting some Lee jeans. I'd most want to win an item from Lee Jeans-probably a new pair of jeans or a jean jacket! Personally I need jeans so I would be looking forward to the Lee gift but am most appreciative to both of these. Thanks. The lee jeans because I really need a knew pair of jeans and I would enjoy the other one too. something from Lees would be cool! My son could use some new pants! I would love to get both, Zoey's Attic for my best friends baby shower and some jeans for me! I would love the Lee jeans. I am excited about the jean jacket. I use to have one that I wore all the time. I could use some new jeans. id love the jeans! i have 1 pair that actually fits! I'm looking forward to Zoey's Attic. Such adorable stuff! I'm most excited to win something from Lee. I would really like an item from Lee! I love jeans but don't have many that fit that great! I would love something from Lee Jeans. I'm most excited about the Zoey's Attic gift card.Thanks for the chance to win! I'm most excited about the jeans! I could really use a new pair! I would love the Lee item for me but I really am excited for the Zoey's Attic for a friend who is pregnant.They have this great super hero birth announcement pillow that is perfection!courtafi2138 at gmail dot com. I'm looking forward to the Lee jeans win. It's so hard to find a pair of jeans that fit just right everywhere! All the pieces look great and I love the jean jacket. I am most excited about winning the Lee Jeans item. I am the most excited to possibly win the Zoey's Attic! Lee Jeans is a big plus, but I like trying out new things and haven't tried anything from Zoey's Attic yet! I would love to win the Lee Jeans! Zoey's Attic for the granddaughters. I would love to win the Zoey's Attic prize for my girls! I'd be most excited about Zoey's Attic so I could get my daughter a cute shirt. A lee's jeans item! Since I've lost a bit of weight, I can finally fit back into my old ones. I am most looking forward to the Zoey's Attic. They have so many great items to choose from. I'm looking forward to the Lee jeans. I am most excited by the Lee Jeans item. They have so many great items to choose from. I'm most excited by the possibility of winning an item from Lee Jeans. I love their products. I'm most excited to win the Lee's! Thanks for an awesome giveaway! im excited about Lee jeans! I'd love the opportunity to go shopping at Zoey's Attic for my sweet little Elizabeth Mae. I would love to win a pair of lee jeans!! I would love a new pair of jeans. So the Lee Jeans is what I am most looking forward too. I'd love to win some Lee jeans. I am most excited to win the Zoey's Attic gift card! I would like to win some lee jeans !